When anthropologists interviewed Honduran and Nepali smallholders in the mid-1990s, they were told that “Insects are a terrible mistake in God’s creation” and “There’s nothing that kills them, except for insecticides”. Even growers who maintained a close bond with nature were either entirely unaware of natural pest control, or expressed doubt about the actual value of these services on their farm. Farmers’ knowledge, beliefs and attitudes towards pests and natural enemies are of paramount importance to the practice of biological control, but are all too often disregarded. In this study, we conduct a retrospective analysis of the extent to which social science facets have been incorporated into biological control research over the past 25 years. Next, we critically examine various biological control forms, concepts and technologies using a ‘diffusion of innovations’ framework, and identify elements that hamper their diffusion and farm-level uptake. Lastly, we introduce effective observation-based learning strategies, such as farmer field schools to promote biological control, and list how those participatory approaches can be further enriched with information and communication technologies (ICT). Although biological control scientists have made substantial technological progress and generate nearly 1000 papers annually, only a fraction (1.4%) of those address social science or technology transfer aspects. To ease obstacles to enhanced farmer learning about biological control, we describe ways to communicate biological control concepts and technologies for four divergent agricultural knowledge systems (as identified within a matrix built around ‘cultural importance’ and ‘ease of observation’). 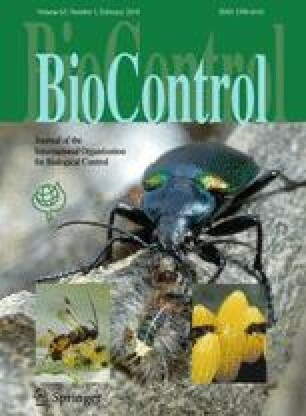 Furthermore, we describe how biological control innovations suffer a number of notable shortcomings that hamper their farm-level adoption and subsequent diffusion, and point at ways to remediate those by tactical communication campaigns or customized, (ICT-based) adult education programs. Amongst others, we outline how video, smart phones, or tablets can be used to convey key ecological concepts and biocontrol technologies, and facilitate social learning. In today’s digital era, cross-disciplinary science and deliberate multi-stakeholder engagement will provide biocontrol advocates the necessary means to bolster farmer adoption rates, counter-act surging insecticide use, and restore public trust in one of nature’s prime services. We thank Mr. Gregorio D. Daga (Visayas State University) for most valuable help with some of the analyses. Ms. Le Ngoc Lan and Lisa Anderberg carried out survey work in rural Vietnam and Laos, which helped frame some of the concepts in this paper. The writing of this manuscript was possible with financial support through the global, CGIAR-wide Research Program (CRP) on Roots, Tubers and Banana (RTB).